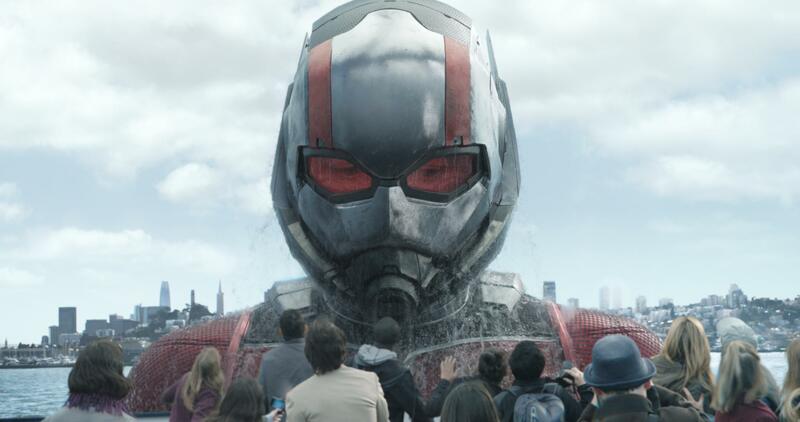 UPDATED: Sun., July 8, 2018, 8:08 p.m.
NEW YORK – Despite its heroes’ diminutive size, “Ant-Man and the Wasp” opened with typical Marvel might at the box office, with an estimated $76 million in ticket sales. “It came in solidly within of our range and definitely sized-up the sequel,” said Taff. “Ant-Man and the Wasp,” with a reported production budget of about $160 million, may have performed well enough to firmly establish its place among Marvel’s more main-line superheroes. Reviews were good (86 percent fresh on Rotten Tomatoes) and audiences gave it an A-minus CinemaScore. Ticket sales overseas added another $85 million. Befitting the summer season, the weekend’s top five films were all sequels. The weekend’s other new wide release was Blumhouse Productions’ “The First Purge,” the fourth film in the low-budget horror franchise about an annual 12-hour period of lawlessness. With July 4th falling on a Wednesday and thus depriving Hollywood of a holiday weekend, Universal opted to release “The First Purge” on Wednesday, while “Ant-Man” waited for the customary Thursday night previews. “The First Purge” debuted with $32 million over the five-day frame, and $18.5 million for the weekend. Particularly following 2016’s “The Purge: Election Year,” the franchise has made satirical jabs at social commentary. “First Purge,” a Staten Island-set prequel, focuses on the ritual’s origins as a method of culling minorities. Some Los Angeles theaters overperformed, executives said, likely due to those seeking air conditioning during the Southern California heat wave. But whether due to travel- or weather-related reasons, nationwide ticket sales were unexpectedly soft on Saturday. The weekend was about 10 percent off the pace of the same weekend last year, when “Spider-Man: Homecoming” opened, according to comScore. But the summer box office overall, up 13.5 percent from last year, remains robust. The films that trailed “Ant-Man” hit their own milestones. Disney’s “Incredibles 2” passed “Finding Dory” to become Pixar’s top-grossing film domestically, not accounting for inflation. It earned $29 million in its fourth weekend, bringing its domestic total to $504 million and its worldwide haul to $773 million. With $28.6 million in its third weekend, Universal’s “Jurassic World: Fallen Kingdom” crossed $1 billion worldwide. It’s done especially well internationally, which has made up 69 percent of the dinosaur sequel’s global footprint. Movie theaters in China were packed by a based-on-a-true-story black comedy about a man who becomes a savior to leukemia patients by smuggling cheaper generic drugs from India. The Chinese film “Dying to Survive,” which has drawn comparisons to the AIDS drama “Dallas Buyers Club,” opened with $146 million in the world’s second largest movie market, according to comScore. .
1. “Ant-Man and the Wasp,” $76 million ($85 million international). 2. “Incredibles 2,” $29 million ($35.7 million international). 3. “Jurassic World: Fallen Kingdom,” $28.6 million ($27.6 million international). 4. “The First Purge,” $17.2 million ($10.9 million international). 5. “Sicario: Day of the Soldado,” $7.3 million ($3 million international). 6. “Uncle Drew,” $6.6 million. 7. “Ocean’s 8,” $5.3 million ($7.7 million international). 8. “Tag,” $3.1 million ($2.9 million international). 9. “Won’t You Be My Neighbor,” $2.6 million. 10. “Deadpool 2,” $1.7 million. 1. “Dying to Survive,” $146 million. 2. “Ant-Man and the Wasp,” $85 million. 3. “Incredibles 2,” $35.7 million. 4. “Jurassic World: Fallen Kingdom,” $27.6 million. 6. “The First Purge,” $10.9 million. 7. “Happy Dad and Son 3: Adventure in Russia,” $10 million. 8. “Animal World,” $8.5 million. 9. “Ocean’s 8,” $7.7 million. Published: July 8, 2018, 8:08 p.m. Updated: July 8, 2018, 8:08 p.m.